November is my favorite month for getting out on the trails. I can just imagine the look on your face as you read that sentence. Really? November? Is that a typo? No, it’s no typo. November really is my favorite. Late fall can easily be overlooked as a time to get outside on the trails. From June to August, it is warm and (hopefully) sunny. Swimming, boating, and hiking seem so easy, so natural. Then in September and October, the days become crisp. The fleeces, sweaters, and wool socks that felt so itchy last May suddenly feel warm and inviting. We bundle up a little, even though it isn’t really cold yet, grab our cameras, and head out to take fall foliage shots. Once the leaves have fallen and the pumpkins have been carved, store windows start to fill with Christmas decorations and the radio and internet are full of reminders to get our lift tickets now before the prices go up. The problem, of course, is that snow may not fall for a couple of months. The big ski hills might start to make snow earlier, but it just isn’t quite the same, and the woods are still empty of powder. I used to spend much of November and December on the couch turning my head between The Weather Channel and the window—Is it going to snow? Is it snowing? Then a couple of years ago I got a dog. A very active dog. She was not going to sit with me and wait for snow, so we headed outside, and I realized what I had been missing. Late fall is actually a great time—maybe even the best time of the year—to get out on the trails. In November the landscape shifts, or at least peaks through. Sure, the fall leaves are beautiful, but they also block the views behind them. 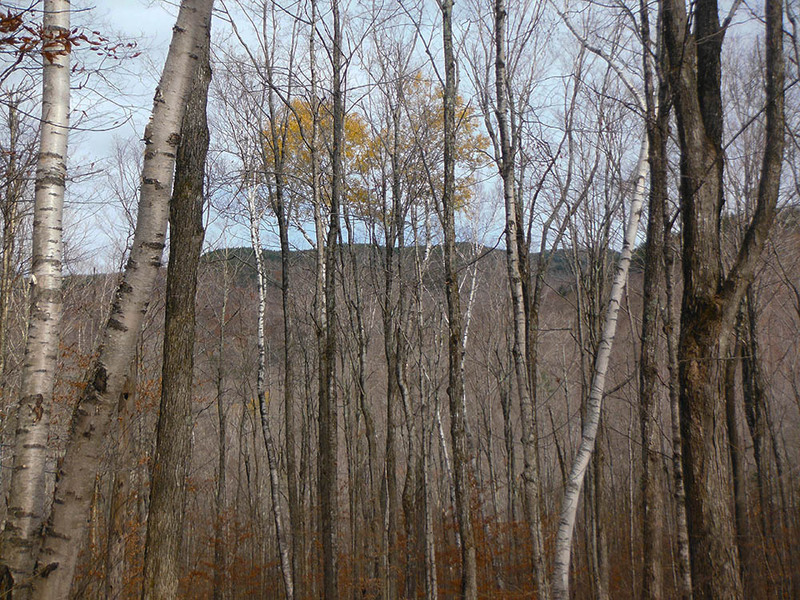 Once the trees are bare, the peak-a-boo views become panoramas. And once you have a better view, you also get a much better feel for where you are in relation to natural landmarks. You start navigating using topography instead of just maps. The bare trees allow more sunshine on your back, keeping you warm on chilly days. In late fall the trails are also in great condition. The leaves can be a little slick, but they make a wonderful crunching with each step and you don’t have to contend with the snow melt, thaw, and rain that muck up the trails in spring and early summer. 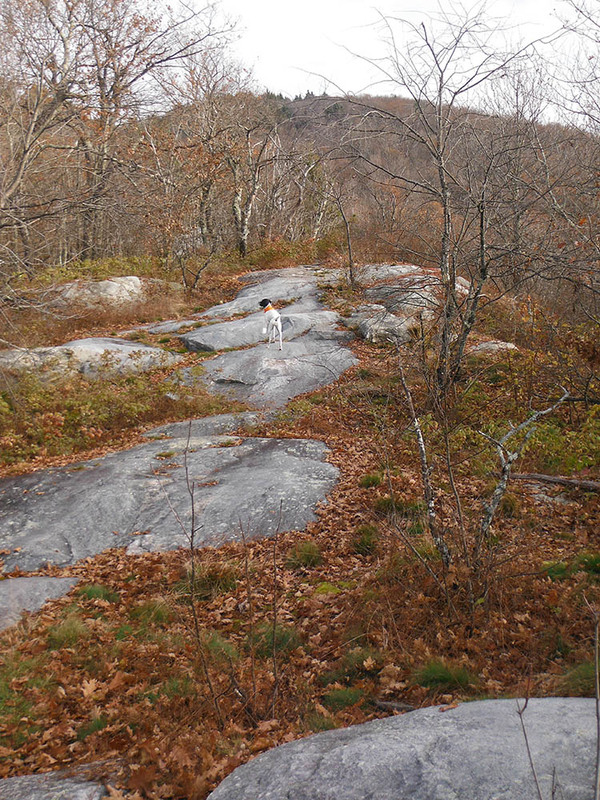 On a recent chilly day, my dog and I headed to Lyme to hike the section of the Appalachian Trail from the Dartmouth Skiway to Route 25A, just east of Orford, crossing Smarts Mountain and Mount Cube. For me, it was a little hard to get started with temperature hovering around 33 degrees, but once I got moving I immediately warmed up. It felt good to hike for hours without overheating or feeling dehydrated. And my dog was in heaven. In the summer months, she wants badly to play, but she melts quickly when the thermometer hits 80. In this weather, she comes alive, bounding through the woods (in her orange UVTA bandana of course). I’ve done this same hike before in other months, but this time it was different. The views were more frequent. I could see the ridgeline I would climb next. 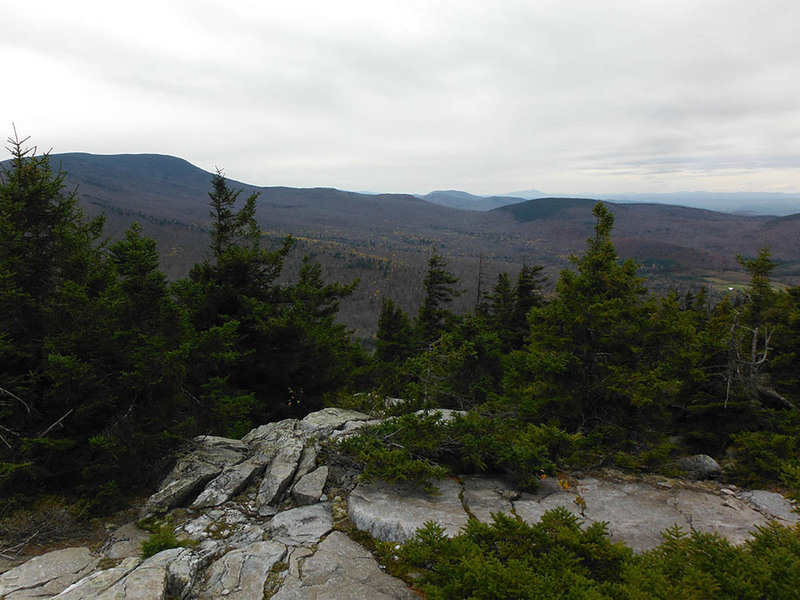 On the way down Mount Cube, a section of trail usually lacking in views, I could see Mount Moosilauke rising up to the north. A whole new world had opened up. And the best part of all? A hot chocolate after the hike felt just right. You can’t say that in the summer! Not sure where to go? 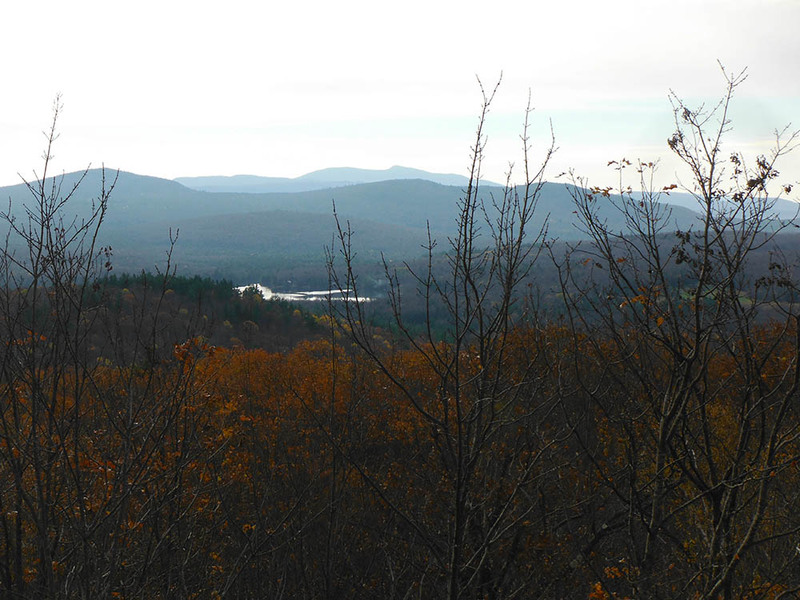 Head to the UVTA Trail Finder to find your next late fall adventure. Emily Wynes is an outdoor enthusiast from Lebanon, NH, who shares UVTA’s commitment to connecting people with trails. Emily is a co-founder of FarNorthEndurance.com, an online magazine devoted to trail running and other endurance adventures in the Northeast, and a volunteer with the UVTA. When she isn’t typing furiously on her computer, you can find Emily exploring the trails of the Upper Valley with her dog, Otter, and teaching yoga at Bikram Yoga Upper Valley. Thanks for the UVTA trail finder link!